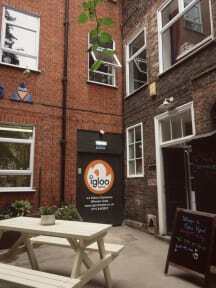 Igloo Hybrid Ho[s]tel - located in the very heart of Nottingham City Centre 1 minute walk from the town square, is our latest offering to the city accommodation market. Featuring inspired boutique rooms sleeping from 1-6 people in dorm and private rooms - some doubles with own bathroom. All our rooms offer creature comfort facilities with memory foam mattresses, reading light and USB ports, full length mirror, desk and chair as well as double glazed windows and thermal blackout curtains. Located right in the heart of Nottingham, less than a 1 minute walk to Market Square. Everything you could want or need is just a stone's throw away! There's a grocery store across the street, your choice of coffee shops, the castle and robin hood statue 5 minutes away, oldest pub in england, cafe, basically, if it is in Nottingham City Centre we are very very close to it! Compact SleepBox inspired Beach Hut (5.4 sqm) with small double bed for single/double use. Private lockable space within large room featuring memory foam mattress, desk, chair and full length mirror with access to bathroom shared between 3 rooms. Lockers are provided in all dorm rooms and our private rooms also feature Freeview TV's. SleepBox inspired quarters include our Train room and Beach Huts which offers compact private accommodation within a themed room and communal bathroom. Communal facilities include a large fully-equipped self-catering kitchen and dining room, a spacious lounge with library and FreeView TV and a private sun trap garden courtyard. e room featuring memory foam mattresses, desk, chair and full length mirror with access to bathroom shared between 3 rooms. Bunk bedrooms sleeping from 4-6 with memory foam mattresses, reading light and USB ports. Lockers, full length mirror, desk and chair. Private double room – photo mural, memory foam mattress, desk, chair, full length mirror, Freeview TV. Private double room en-suite - photo mural, memory foam mattress, desk, chair, full length mirror, Freeview TV, private bathroom in room with instant hot water shower. Should you wish for payment to be charged to a different card or split payment over several different cards, then please be sure to contact our reception team with new card details on the number below at least 4 days prior to your arrival date. Check in from 3PM to 1AM . We take a £20 key-deposit per set of keys upon arrival, which will be returned to you when checking out. Maximum group size is 5 for online bookings. For groups bigger than 5, you must contact our reception team directly. Any online bookings made for more than 5 people will be considered invalid. A 50% non-refundable deposit is required for bookings of 4 nights or more. Only a brief stay while I was in the city. But 10/10! Staff were lovely and helpful, rooms were good and clean & beds were comfortable. No faults. One of the best hostels I've stayed at. 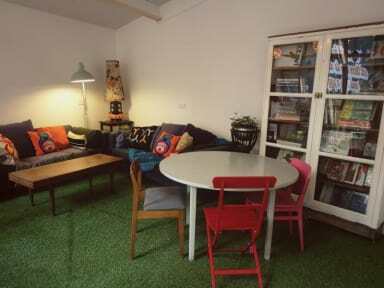 Rooms are spaceous and cosy, beds are comfy and the staff are really nice. Location is perfect - short walk to buses/trains, and right in the city center. Would have liked electrical sockets closer to the beds, but I guess that's just a fault of older English houses. Great stay! I had a great stay, the common area is so comfy and spacious! Great experience for one night stay in Nottingham room was really small with only one other person which was nice. Facilities good just the same high standards as the other igloo Nottingham hostel. Great location in city centre of Nottingham. Friendly staff with quick and easy check in and check out processes. You might want a padlock for the lockers, or pay £5 for one from reception. They have lots available to buy if you forget something. Towels are £2 for example. Only downside was the lack of bathrooms. The toilet and shower are in same room so if people are taking showers, no-one can use the loo. With only 2 bathrooms per floor and approx 20 people per floor, this was not sufficient. Cute place. I'd go back and would recommend it.